San Francisco’s placekicker David Akers had to feel a bit of redemption about his performance in Super Bowl XLVII against the Ravens. 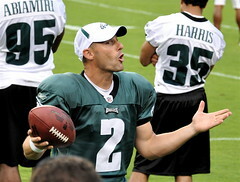 Akers was successful on three field goals in three attempts. This three-for-three performance came on the heels of a season where he was almost run out of town because of a less-than-stellar regular season. With Baltimore’s kicker Justin Tucker also making two field goals, the two Super Bowl kickers last season tied a game record for most field goals made in a Super Bowl contest with five. The last time there were five field goals made in a Super Bowl was in the 1994 Super Bowl when the Dallas Cowboys defeated the Buffalo Bills. Twenty-two placekickers have made 80 percent or more of their playoff field goal attempts since the start of the Super Bowl era. Leading that list is Martin Gramatica who made 13 of 14 playoff field goals for a 92.9 percentage in his career. In looking at field goals attempted in the 47-year history of the Super Bowl, there have been 170 attempted with 123 successful, a success percentage of .724. Teams that won the Super Bowl are 78 for 103 in field goal attempts in the game (.757), while teams that have lost the Super Bowl have made 45 of 67 (.672). Ten times in the Super Bowl has a placekicker missed two or more field goal attempts. Last to do so was Seattle’s Josh Brown in the Super Bowl XL versus the Steelers. Dallas’ Efren Herrera holds the Super Bowl record for most field goals missed in a game with three (he did it in Super Bowl XII). Fortunately, the Cowboys still won that game. In fact, of the ten times when a team’s placekicker missed two or more field goal attempts in a Super Bowl game, those teams are 6-4.